Knoxville Park Attractions include monuments, nature centers, gardens, and the nearby Great Smoky Mountains. Order your Knoxville Planning Guide here. Alex Haley Square is a part of Morningside Park in east Knoxville. 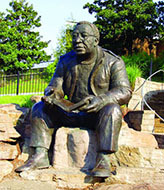 The park has the only 12 foot high bronze statue of author and Pulitzer prize winner Alex Haley. Haley is best known for his book, Roots, in which he traced his origins back to Africa. His book was made into an acclaimed television mini-series. The statue is the focal point of the park. It was designed by sculptress Tina Allen and cast in bronze in New York City. The statue weighs 4,200 pounds and was dedicated in February 1998 during Black History Month. Other amenities in the park include a play structure, water fountain and green space. Great Smoky Mountains National Park is located in the Blue Ridge Mountains, part of the southern Appalachians. It straddles the Tennessee-North Carolina border for 70 miles. The Cherokee people called this area Shacomage, or "Place of Blue Smoke." The bluish mist, which clings to the mountainsides and fills the valleys, gives the park its name and remains its most distinctive feature. The park is 520,976 acres. Ijams Nature Center is a city park and community nature center. In its eighty plus acres, foot trails wind across streams, meadows, fern banks, and past bluffs overlooking Fort Loudon Lake. The abundant variety of wildflowers, grasses, and native trees provides cover for the animal population which includes turtles, raccoons, and muskrats among others. Ijams is also a bird sanctuary. Over 40 species have nested on the property, with many others visiting. Botanical Gardens. Three acres of seasonal plantings. Mon-Fri. 10 am-4 pm. Ivan Racheff purchased the Knoxville Iron works in the early forties and dreamed of a garden growing in place of the rubbish and garbage that was on site. Through the years his garden grew and in 1970 was given to the Tennessee Federation of Garden Clubs to maintain. The Knoxville Zoo is open year round and offers special programs such as Bedtime with the Beasts. The zoo celebrate the wonders of the natural world. Through education, conservation, exhibition, research and recreation, the zoo tells the stories of the animals, the plants and the people who make up the communities of the earth. Volunteer Landing sits on the Tennessee River in downtown Knoxville. Visitors to the Park can enjoy fishing, biking, and other water sports and activities while here. Play fountains offer several interactive geysers for splashing and getting wet. There are three waterfalls for scenic beauty, picnic tables, a playground, a marina, and a restaurant. There are also several historical features at the landing. During UT home football games, the Vol Navy lines the River along Volunteer Landing to create a sea of orange full of fun and excitement to cheer on the home team. The park offers several acres of lawn, waterfalls, and streams. It is the site for festivals, meetings, performances, conferences, and a peaceful environment for relaxation. Water features include interactive fountains and a one-story-high geyser. A performance lawn, larger than two football fields, provides a natural amphitheater-like setting perfect for concerts, festivals, parties and other special events.